In her new book, Syria: Recipes for Olive Oil and Vinegar Lovers—out Tuesday, September 18th—Canadian author, food expert and entrepreneur Emily Lycopolus continues her tradition of providing inventive, delectable recipes that fold in the often overlooked ingredients of both olive oil and vinegar. Lycopolus showcases an admirable knowledge of Syrian spices and makes innovative pairing suggestions, highlighted by beautiful photography. 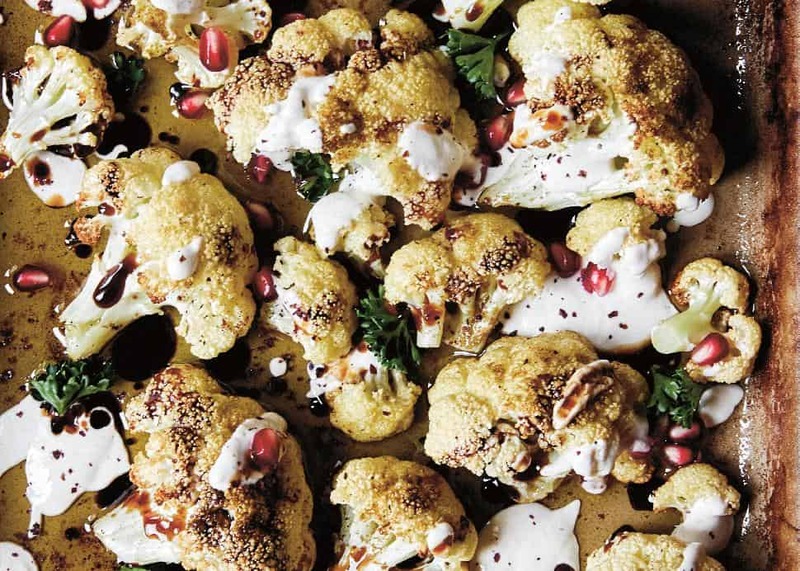 DL AckenCauliflower is most commonly prepared in Syria as a mezze. However, this classic vegetable makes a roasted salad that is delicious, healthy and heartwarming in the winter months. Drizzling it with pomegranate dark balsamic vinegar and Tahini garlic yogurt Sauce adds a creamy brightness to the dish that makes it utterly irresistible. Preheat the oven to 450F. Line a baking tray with parchment paper. Separate the head of cauliflower into small florets, place them in a medium-sized bowl, drizzle the olive oil over top, sprinkle with the cumin, and mix to ensure the florets are evenly coated. Arrange them evenly on the prepared baking tray. Roast for 15 minutes, until the cauliflower is fork-tender and the tips are golden brown. Allow to cool completely on the baking tray. Enjoy immediately. In theory, you can store it in an airtight container for up to 3 days, although it will get soggy after a night in the fridge so it’s best enjoyed the day it's made. DL AckenThis recipe is a total favorite of mine. 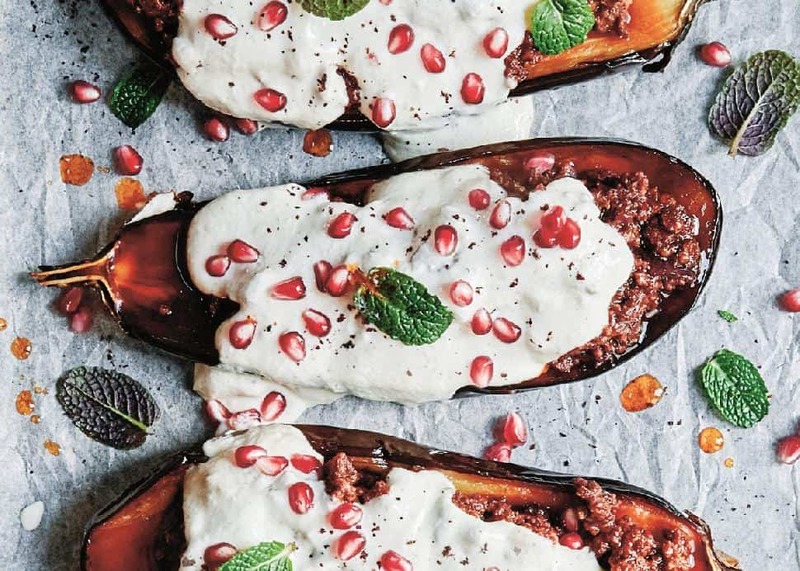 Silky smooth eggplant paired with spicy rich minced meat and topped with a bright burst of pomegranate and fresh mint, this dish is a prime example of simple ingredients working together to create a fantastic whole. The spicy Harissa-infused olive oil flavours the eggplants as they roast, the pomegranate dark balsamic vinegar adds a sweet richness to the lamb, and the creamy garlic yogurt sauce guarantees a refreshing, smooth end to each mouthful. Bliss in a dish! Slice each eggplant lengthwise, leaving the tops and stems intact to use as little handles. Trim any longer green pieces from the bottom of the stems, if needed. Sprinkle 2 tsp of the salt over the eggplants and let stand for 10 minutes while the eggplant sweats. Wipe dry, use 2 tbsp of the olive oil to brush all the cut sides, then sprinkle with remaining salt, the cumin, and pepper. Drizzle 1 tbsp of the remaining olive oil on a roasting pan or baking tray, place the eggplants—cut side up—on the pan, and roast for 15 to 20 minutes, until soft and starting to golden. Remove from the oven and brush the cut sides of the eggplant with the remaining 1 tbsp olive oil. Flip the eggplant over so they are cut side down, and bake for another 15 minutes, or until golden and almost bronzed on the bottom. (I don’t line my pan for this, but it’s also a well-loved, well-seasoned pan. If you have any concerns about sticking, line your pan with foil or parchment.) Remove from the oven and carefully flip over and let rest. While the eggplant is cooking, prepare the filling. Dice the onion and mince the garlic. Place them in a frying pan over medium-high heat with the lamb and sauté for 3 to 4 minutes, breaking up the lamb as it cooks, until the onions are starting to soften and the lamb is beginning to brown and sizzle. Sprinkle in the Aleppo spice, salt and pepper. Sauté for 2 to 3 more minutes, then pour in the balsamic and cook until all the liquid is absorbed and reduced, 5 to 7 minutes. The meat should be saucy but not runny. Mix in the tomato paste and sauté for 1 to 2 minutes to ensure it’s fully incorporated, then remove from the heat. Using a sharp knife, gently make two parallel slices along the length of the eggplant, being careful not to cut all the way through, and at least ½ inch away from the edges of the skin on each side. Using a fork or spoon, gently pull the flesh apart along these slices, making little troughs in the eggplant. Transfer the eggplants to serving dishes, top each one with the minced lamb, filling the troughs and piling a little over top, but still allowing the skin and beautiful golden eggplant to show. Top the meat generously with garlic yogurt sauce, sprinkle with fresh mint and pomegranate seeds, and serve with classic Aleppian rice pilaf, braised beans with Aleppo spices, and extra yogurt sauce on the side. 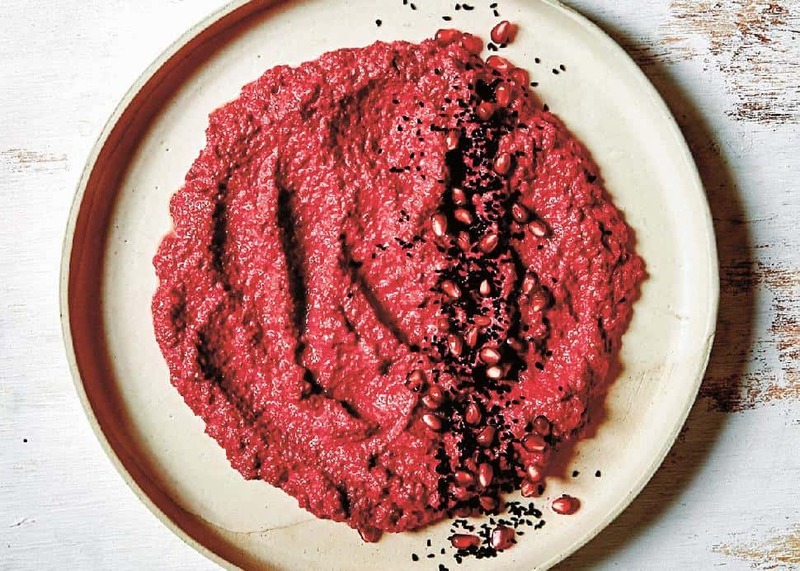 DL AckenA lovely addition to a table of mezze, this dip is bright and cheerful with its beautiful pink colour! I often boil the beets for this, as it’s less time-consuming, but roasting definitely allows the rich sweetness of the beets to develop. Whichever method you try, I recommend doubling the recipe and storing some in the fridge. This is the perfect companion to fresh veggies as part of a lunch or as a snack. Note: Nigella seeds are frequently used in Middle Eastern, eastern Mediterranean and Indian cooking. They are tiny black seeds that have a slightly spicy warm onion flavour and are a beautiful addition to many dishes. They are typically found in Mediterranean specialty stores or spice shops. To roast them, preheat the oven to 400F. Wrap the beets tightly in aluminum foil, and roast until tender (a knife should slip in easily), about 45 minutes. Remove from the oven and allow to cool completely in the fridge. To boil them, bring a saucepan of water to a boil over medium-high heat, add the chopped beets, and boil until tender (a knife should slip in easily), 15 to 20 minutes. Drain the beets and allow to cool completely in the fridge. Roughly chop the garlic and place it in the bowl of a food processor. Add the cooled beets, pickled beets, and pulse to break them up a bit, then add the Tahini, yogurt, balsamic, lemon juice and salt to taste. Blend until combined but not completely smooth. The dip should have a bit of texture. Spread on a serving plate or in a bowl, garnish with sprigs of parsley, a sprinkle of nigella seeds and a hearty drizzle of olive oil. Serve with vegetables and flatbread. You can store this in an airtight container in the fridge for up to 1 week. 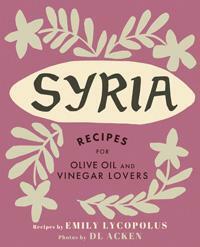 Excerpted from the book Syria: Recipes for Olive Oil and Vinegar Lovers by Emily Lycopolus. Copyright © 2018 by Emily Lycopolus. Reproduced with permission from TouchWood Editions. All rights reserved. Photography by DL Acken.